Everybody knows the benefits of meal prepping: It makes healthy eating easier, it’s cost effective, and it’s an investment in yourself — but it also takes time. We rounded up 12 of our favorite time-saving meal prep tips, so even the busiest of people can fit it into their schedules. 1. Write a weekly grocery list and only make one trip. When you’re short on time, the last thing you want to do is make several trips to the grocery store. Instead, aim to only go shopping once — and if you can, try to go on a weekday when the store is not as busy. Pro tip: Hang a running grocery list on your fridge and keep track of items you run out of. This way, when you’re meal prepping, you won’t run into any surprises (like realizing you don’t have olive oil or salt). 2. 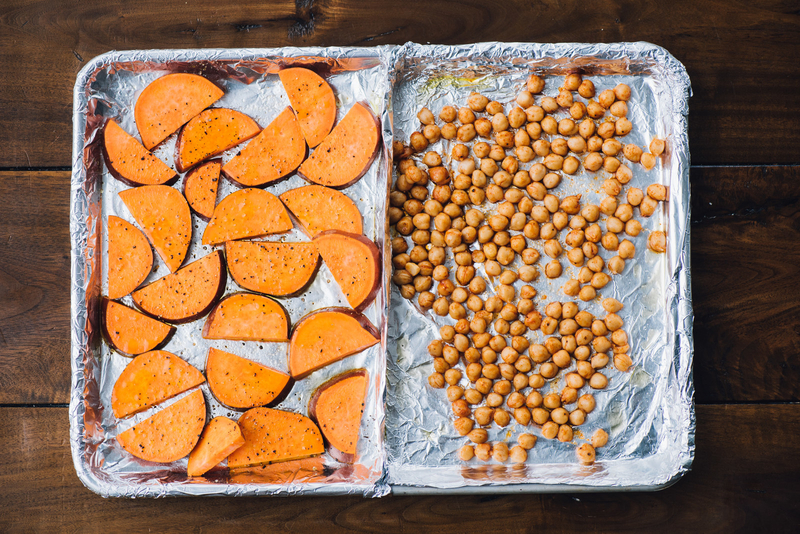 Cook several things at once by dividing your sheet pan using foil. 3. Buy a slow cooker and prep yourself some dump dinners. Dump dinners are slow cooker recipes where you can throw all your ingredients in at once. These recipes are great for meal prepping, as you can prep all of the ingredients, throw them into Ziploc baggies, and store ’em in the fridge or freezer until you’re ready to cook. That way, in the morning, you just dump it all in the slow cooker and let it cook all day. More: Learn how to prep a week’s worth of slow cooker meals and check out 27 dump dinner recipes that practically cook themselves. 4. Don’t be ashamed of splurging on shortcut ingredients if you feel like they’re worth it. Store-bought ingredients can be pricy, but the time it saves you can be well worth the cost. If you don’t have a ton of time on your hands, buying things like dressings or hummus (instead of making it yourself) can save you a ton of time and promote healthy eating during the week. 5. Cook just a handful of items, but combine them in exciting ways so you don’t get bored. A nice tomato sauce can be tossed over pasta, used in shakshuka, or even turned into a hearty stew — so get creative about how you use your meal prep so you don’t get burnt out eating the same thing over and over again. Meal prepping is all about investing time in the beginning of the week so it saves you time later in the week. A good rule of thumb is to limit your meal prepping to just one day a week (usually Sunday), then keep your daily cooking to under 20 minutes a day (reserved for reheating and quickly cooking last minute items). This will make sure your meal prepping time is actually paying off and freeing up some time. 7. But if you’re someone who needs to cook dinner every night, meal prep just the components to make it easy. Eating the same meal over and over again gets boring, so instead of prepping the same meal for each day of the week, prep individual components such as diced onions or minced garlic so you can easily make off-the-cuff dinners that are different every night. For example, if you have cooked rice, you can make grain bowls, stir-frys, or sushi rolls throughout the week without a ton of work. More: Get step-by-step instructions for prepping minced garlic for the freezer. 8. Freeze any leftover prep for the following week instead of throwing it away. Cooked a big batch of veggies and realized it was too much? Just freeze the leftovers and use them for the following week. Figuring out how much food to prep can be hard at first, so finding ways to repurpose your excess prep not only cuts down on food waste, but can save you some time during the following week. 9. Invest in a vacuum sealer so you can meal prep big batches of foods and freeze them. Owning a vacuum sealer may seem excessive, but it can come in handy when meal prepping. You can prepare large batches of food, seal them in airtight bags, and pop them in the freezer until you’re ready to eat. It’s especially helpful for slow cooker prep, stews, or other hearty meals you can just snip open and reheat. It also allows you to buy meat in bulk and freeze it without the risk of freezer burn. Get a FoodSaver vacuum sealer on Amazon for $59.99. 10. Fill your freezer with homemade frozen meals so you can come home to something healthy and delicious after a long day. Using that vacuum sealer you invested in (or just regular Ziploc baggies), prepare yourself some DIY freezer meals you can reheat after a long day of work. Unlike store-bought frozen dinners, you’ll know exactly what’s in these. Think of them as your backup meal prep; the meals you turn to when just 10 minutes of cooking seems impossible. More: 27 make-ahead recipes that freeze well and make great leftovers. 11. If you’re a smoothie lover, freeze individual smoothie packs so all you have to do is blend them up in the morning. Smoothies are another great item to prep and stash in your freezer. Just cut up all of the components, place them into baggies that are already measured out, and store them in your freezer. In the morning, take one of the bags, dump it into your blender, and breakfast is done. More: Learn how to make freezer smoothie kits. 12. Instead of making individual portions of oatmeal everyday, make a big batch of baked oatmeal — or make overnight oats. Oatmeal is a great breakfast option that keeps you full, but unless you’re using instant oats, they can take a bit of time to cook in the morning. Instead, add oatmeal to your meal prep routine so it’s ready to go during the week. 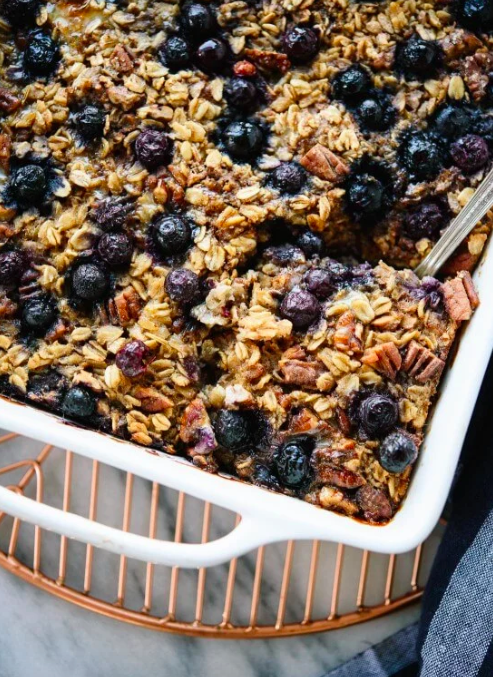 Baked oatmeal is a great way to make a big batch of oatmeal you can load with fruit, while overnight oats is a simple way to make individual portions without having to actually cook anything. 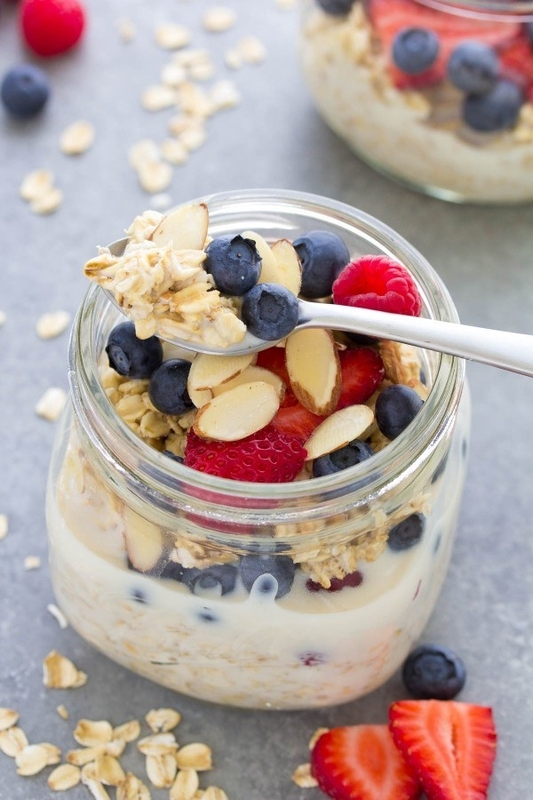 More: Get a recipe for blueberry baked oatmeal or a recipe for overnight oats.